A unique adrenaline filled experience on the Roman coast with Parachute Jump in Tandem. The tandem jump will take place near Rome Neptune in the Roman coast. Rome launch with tandem parachute experience the thrill of flight accompanied by an experienced instructor. 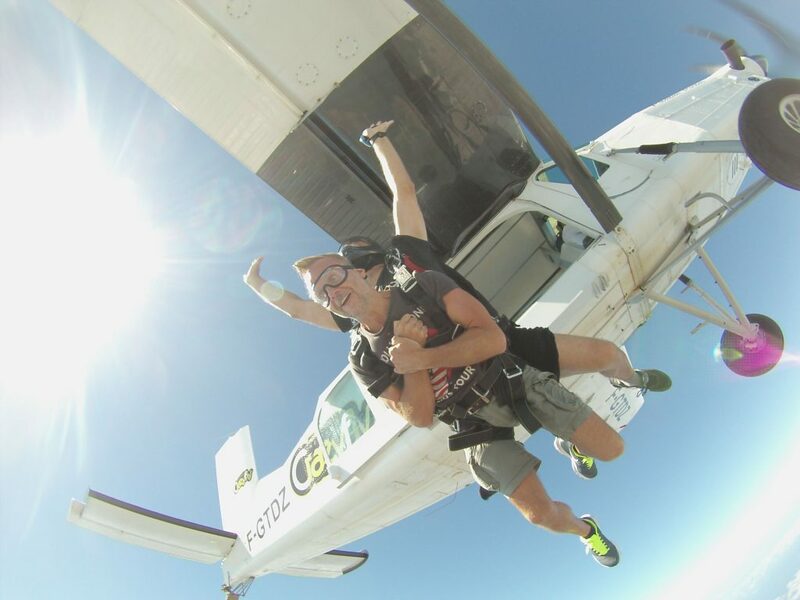 Rome tandem jumping - Experience the thrill of flight accompanied by an experienced instructor. The jump will take place in Nettuno, near Rome in the Roman coast. After a lecture in which you will be given the necessary information, you will board a plane that will take you to an altitude of 4000+ meters. During the flight you will enjoy a beautiful landscape, you will have a unique view of the Roman coastline. After reaching the required altitude will start your Parachute Jump in Tandem. Attached to your instructor you will experience the thrill of free falling down to over 200 km / h for about 50 seconds. Rome tandem jumping - At this point the instructor will open the two-seater parachute and your skydiving will continue with a placid flight of 5 minutes where you can enjoy a 360 degree view of the sea and the Roman countryside. Through the appropriate controls and with the help of your instructor you will steer your parachute to a safe and comfortable landing. If you want, all your experience, from initial preparation to landing, it can be filmed and enclosed in a DVD that will be delivered immediately after the experience along with a special certificate of participation. The location where the Parachute Jump in Tandem begins and ends in a beautiful oasis surrounded by woods and fields, with sun terrace, garden, playground and farm with typical cuisine. Even your companions will be able to enjoy a pleasant day. No need of any patent or license for the Parachute Jump in Tandem, since the instructor has all the practical and theoretical knowledge needed. The experience is as follows: of the phases of flight training briefings and safety precautions, dressing with suit, helmet and goggles, airplane flight to reach 4000 meters (rise time to launch share: 15 minutes), with skydiving freefall of about 50 seconds and parachute flight of 5 min, landing.